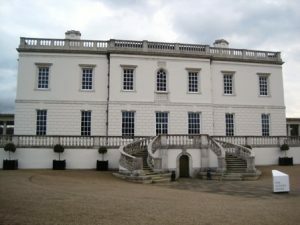 The Queen’s House is next to the National Maritime Museum in the north west corner of Greenwich Park and houses the museum’s art collection which includes Turners, Holbeins, Hogarths and Gainsboroughs. The house was begun between 1614 and 1618 for Anne of Denmark, wife of James I and completed in 1638 by architect Inigo Jones for Henrietta Maria, queen of King Charles I. It was the first neo-classical building to be constructed in Britain. 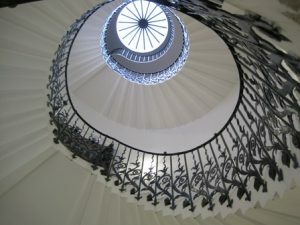 The house is notable for having Britain’s first centrally unsupported spiral staircase, the interior of which is reminiscent of a sea shell. The recurring tulip motif in the balustrade reflects the tulip craze of the 17th Century. During this stock market bubble the price of bulbs of the recently introduced tulip reached extraordinary heights – in early 1637 a single bulb of certain varieties fetched 10 times the annual salary of a skilled craftsman. However, one day later that year a trader in Haarlem failed to pay for his previous day’s purchases starting a chain reaction resulting in prices swiftly crashing to a hundredth of their previous levels. The unlucky traders left holding bulbs lost a fortune. The great hall is in the shape of a cube with 40 foot sides and the white walls contrast spectacularly with the black and white geometric patterns of the marble tiled floor. The Queen’s Chamber on the first floor has a beautiful ornate ceiling. The house has an uninterrupted vista of the River Thames to the north despite the presence of the Old Royal Naval College between the two. This is due to the forethought of the College’s architect Christopher Wren who designed the College in two halves in order to preserve the view from the house. Note: The Queen’s House will be closed from 27 July 2015 until 4 July 2016 while it is being prepared for the 400th anniversary of its commissioning and design.